This is to inform all the candidates that UKSSSC Group C admit card 2019 or UKSSSC Admit Card is released for the post Librarian, Assistant Librarian, Library clerk, Photographer, Cameraman PWD, Junior Cameraman/TV technician,Photographer, Grading Paryavekshak ,Nalkoop Chalak, Kary Paryavekshak, Rajasva Sahayak ,Kanishk Sahayak (कनिष्ठ सहायक ), Data Entry Operator, Kanishk Sahayak/Computer Operator ,Sahayak Lekhakar, Surveyor ,Sub Sports Officer/ Assistant Sports Trainer and Assistant Sports Teacher under UKSSSC Group C recruitment. The Uttarakhand Subordinate Service Selection Commission has released UKSSSC group c exam date 2019 calendar until 13 May 2019. 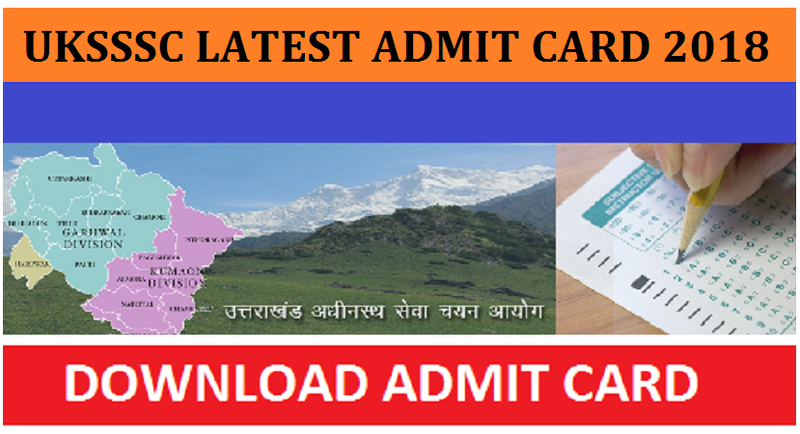 Uttarakhand Subordinate Service Selection Commission has released the UKSSSC Admit Card 2019 on its official website. All the candidates who will be appearing for UKSSSC written Exam 2019 can download their group C admit card 2019 post wise on its official website i.e. www.sssc.uk.gov.in. Go to the official website of Uttarakhand Subordinate Service Selection Commission (UKSSSC) i.e. www.sssc.uk.gov.in.